Has access to specifically assigned clients. Can make use of templates to work with for these clients, but cannot edit them. Has full access to work with clients and templates. Has the same permissions as Users, but can also manage the account and user settings. 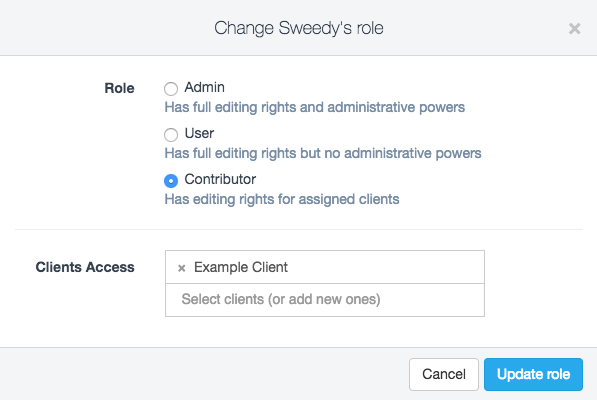 How do I assign a role to a user? Go to the Users page through the left hand menu. On the users page, click on the user who's role you'd like to change. At the top right of the user detail screen a button "Change role" is available. Clicking that will allow you to update the user's role. How do I assign clients to contributors?